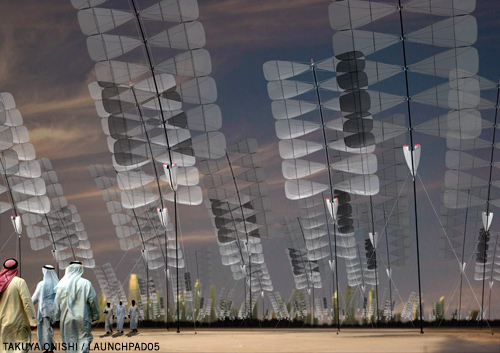 An ordinary solar plant places solar panels and frame structures directly on the ground. The narrow space in between each row combined with the lack of shade and reflections create an unfriendly environment for human, animal and vegetation. 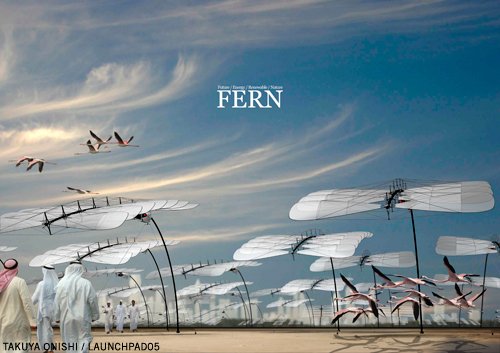 On a site where there is such beautiful scenery and indigenous vegetation, FERN solar plants are designed to gently sway at a minimum of three meters above the ground to provide cover from the sun and add to the visual beauty of the landscape. 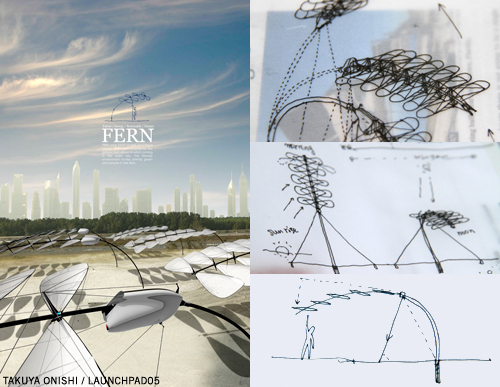 The FERN leaf/solar panel is a semi-transparent and flexible solar cell that gives a gentle light and provides a friendly space for all kind of animal and greenery below. FERN is designed to artfully follow the movement of the sun at all times. A flexible carbon fiber structure with a tension wire adjuster system achieves constant slow movement for following the sun at any position in the sky. A rotation motor for the PV leaf panels provides even greater accuracy. The stalk of FERN is made of material similar to that used for pole vaulting, providing a strong but flexible/springy structure that mirrors a natural plant stalk. FERN leaf/solar panel is “semi-transparent and flexible solar cell on plastic and cloth” which was invented by Prof. John Rogers and his colleagues from the University of Illinois. This innovation gives a gentle, light and friendly lighting effect for plants and animals existing underneath. The site can accommodate 10,256 FERN units which would give the effect of an artificially forested park and would be a welcoming environment for visitors to enjoy the scenery and wildlife. While FERN casts wide shadows during the daytime, it gradually stands vertical in the evening and then lights up to the sky for the night as it slowly turns from the western to the eastern horizon to await tomorrow’s dawn.